I know there are people who go crazy for Halloween. And there are those who hate Halloween. I am not at either extreme, but there is something special about Halloween for me. I am not one of those crazy people who love Halloween (sorry if I just called you crazy). I do not plan out decorations or haunted houses or crazy getups to wear. I do not even dress up to answer the door for trick-or-treaters. But I do like Jack. I have no idea where Jack o’Lantern came from, but I like the whole thought of carving pumpkins. Maybe it is just the artist in me trying to get out. Or the act of carving brings back great memories. I am not completely sure. However, I do know that I love to carve pumpkins with my kids. We used to make wonderful creations. At least they were wonderful for us. I would always pause to take pictures of the process and of course, we would pose the final creations for pictures. Sometimes with the artists. I was sad when those days passed. When the boys were too big to carve pumpkins with their dear ole dad. Actually, I think our oldest would come over to carve with me, but he is so busy now. And I am not completely sure, but our youngest probably just put up with the tradition when he was little. So last year, when he was the only one of the kids in the house (our middle one liked to carve, but it was never a great passion), we did not carve any pumpkins. None. Nada. Nil. And Halloween was not quite the same. Oh sure, the trick-or-treaters came. Many of them held out their bags expecting a treat without so much as a single word. But we made them chant the words, “Trick or treat!” before they got said treat. Then, their parents make them say, “Thank you.” Or they just say it automatically. It was fun as always to see the different kids and parents in the costumes. Still, I missed the Jack o’Lantern tradition. 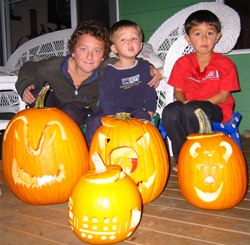 I missed carving those gourds with my boys last year. Well, I got a pumpkin for Halloween this year. And I carved it a week before Halloween. I even took pictures of it lit up on the counter like we always did before. I did not pose next to my creation, but I did post a picture of it on Instagram. Oh how the times have changed. Truth be told, I enjoyed carving my pumpkin even if none of my boys carved with me. One of them was on the couch keeping his mother company watching their TV show while the other two were off living their lives away from us. Growing up stinks. But there is still hope. They might have little ones someday, who like to carve pumpkins too. Like I said before, I am not exactly sure why I like carving pumpkins. I am sure we carved pumpkins when I was young, but I do not remember that as much as I remember a big birthday party. It was a costume party because my birthday is so near to Halloween. We played pin the tail on the donkey and musical chairs. My mom made such a big production of the whole thing. It was so fantastic that I remember it all these years later. But I do not think that my birthday or that one birthday party are why I like Halloween and carving pumpkins. When it comes right down to it, I think I just like carving pumpkins. 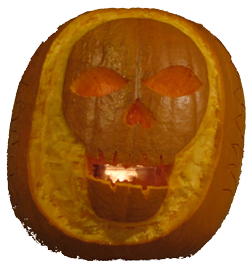 I realized that as I carved one this year without my kids. Oh sure, I would rather have the experience with my boys, but I still had fun without them. I am not one of the Halloween fanatics, but I like seeing other people’s costumes and decorations. But whether I ever have any more trick-or-treaters come to my door, I hope that I always have Jack on my patio. After all, Jack o’Lanterns with funny faces are why I like Halloween.